The association selected its logo in late 2006. Informed by discussion with association leadership, a designer offered a selection of options. All combined clean contemporary type with 19th-century illustrations to suggest a confluence of theology and science, ancient and futuristic. All were intended as warm and friendly, not suggesting science fiction, so as to be appealing to a more general audience. Options incorporated symbols of the millennium, of knowledge, science, medicine, and advancement. After much friendly debate, the voting members of the association chose the option with the winged wheel. Second place went to the option with the beehive, a symbol used by early Mormons that persists today on the Utah state flag, representing industry and unity. No other option garnered much support, although some contain rich symbolism with fascinating meaning and history. As I recall, the race between the winged wheel and the beehive was quite close, and the deciding vote may have come from Andrew West, one of the founders of the association, who concluded that "it would make a cool t-shirt." In the most general sense, the winged wheel may be seen as a symbol of progress. Some see the wheel itself as a symbol of cyclical or regular repetition, and the wings as a symbol of ascendence. In combination, repetition with ascendence suggests a directionality or purpose to work. Despite our real concern for and effort to mitigate risks, Transhumanists tend toward optimism in the opportunities of technological change. Complementing that, Mormons advocate notions of continuous revelation and eternal progression: God enabling humanity to become God, as God became God, and as humanity may yet enable others to become God. Some see in the logo a union of human innovation with divine inspiration. The wheel might represent that which humans can do. The wings, reminiscent of an angel or a dove, might represent that which God can provide. Together, they bridge heaven and Earth in a sanctifying transformation, or transfiguration. Mormons often emphasize the dual importance of both grace and works, faith and knowledge, inspiration and agency, mercy and justice, and other such paradoxically complementing principles. Our scripture emphasizes that God will not save us unless we use means we already have, and offers stories in which God sanctifies tools that humans bring to the work. Some also see in the logo a synthesis of technology and biology. The wheel might represent technology or artificial power, and the wings might represent biology or natural power. Transhumanists look at humanity's historical relationship with technology and see a trend of persistently increasing inter-dependence and intimacy. Projecting that trend forward, we imagine the distinction between technology and biology fading away, as we integrate it ever more intricately into our world, relations, bodies, and minds. Some have suggested that sufficiently advanced technology may be indistinguishable from biology, and that the best technology is so transparent that we stop referring to it as "technology." The particular kind of wheel in the logo is a wagon wheel. This may allude to the wagons and handcarts of Mormon pioneers, who trekked across plains, deserts, and mountains to colonize much of the American West. Their example of hard work, practicality, sacrifice, and persistence in pursuit of seeking out and building a little more heaven on Earth continues to inspire Mormons and many others today. Some Mormon Transhumanists imagine additional pioneering ahead of us, as humanity works through the consequences of accelerating technological change. "They are figurative expressions, used ... in describing heaven, the paradise of God, the happiness of man, and of beasts ... in their destined order or sphere of creation, in the enjoyment of their eternal felicity. ... Their eyes are a representation of light and knowledge, that is, they are full of knowledge; and their wings are a representation of power, to move, to act, etc." Maybe these sublime messengers would call us to knowledge, power, and felicity in ascendent life, severally and together at the heart of creation. 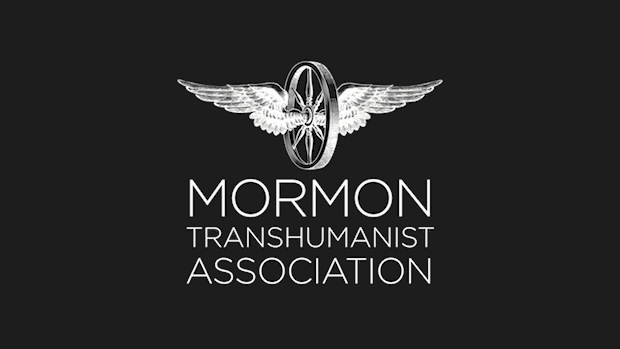 That too could be the meaning of the logo of the Mormon Transhumanist Association -- without beginning, symbols within symbols without end.